I understand that the eternal quest for the veggie burger is to find one that doesn’t fall apart but I think you might be missing out. Sure, this burger might fall apart while you are eating but the flavors are not to be missed. This burger is an imitation of my favorite veggie burger from Tower Cafe. 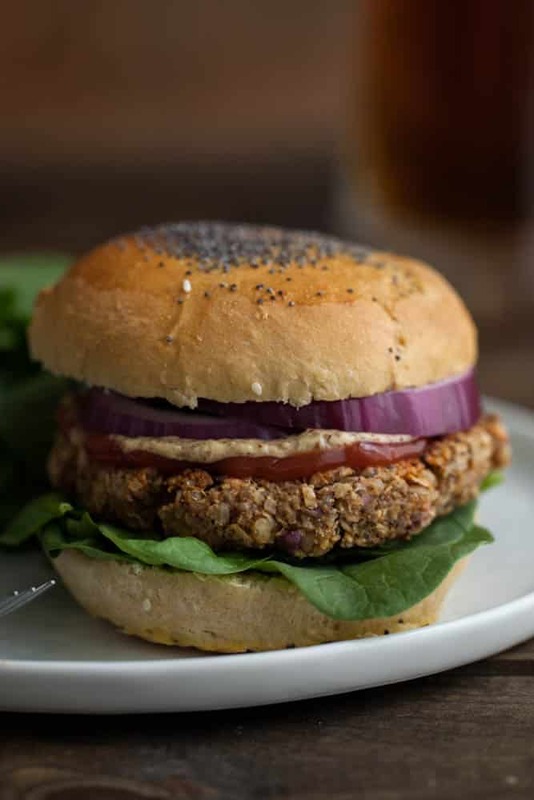 While I love beans, it’s nice to have a veggie burger option that doesn’t include them. As stated, this burger may fall apart but I included a couple of ingredients to aid in the cohesiveness. Short grain brown rice has a bit more starch than long-grain brown rice. This helps create a bit more binding. The egg is also important for this same reason. The nuts can be changed out based on what you have on hand. If a burger isn’t your thing, a simplified crumble is also delicious! 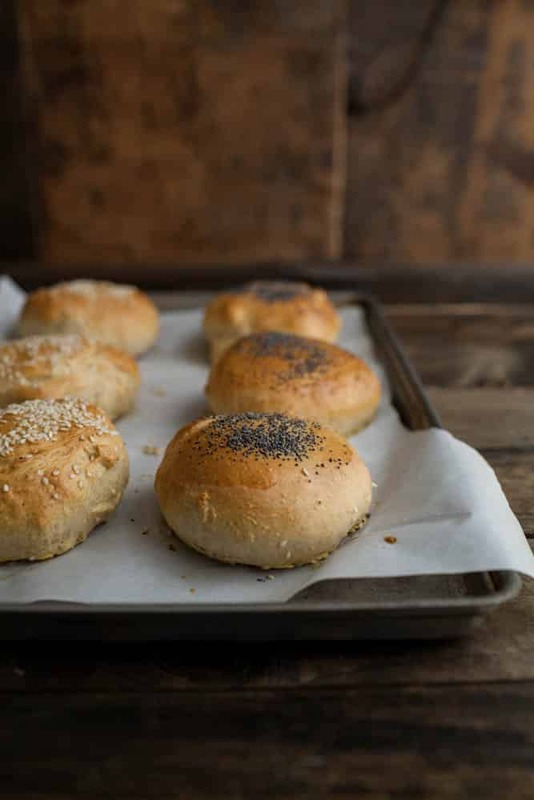 As for buns, I loosely used the Kitchn’s recipe but used half whole-wheat and half unbleached all purpose flour, honey instead of the sugar, and did an egg wash (1 large egg + 1 tablespoon water) then sprinkled sesame/poppy seeds on top of the buns right before baking. In a large skillet, combine pecans, walnuts, and sunflower seeds. Stirring frequently, lightly toast the mix over low heat, 4-5 minutes. Nuts should be fragrant. Remove from heat and let cool slightly. 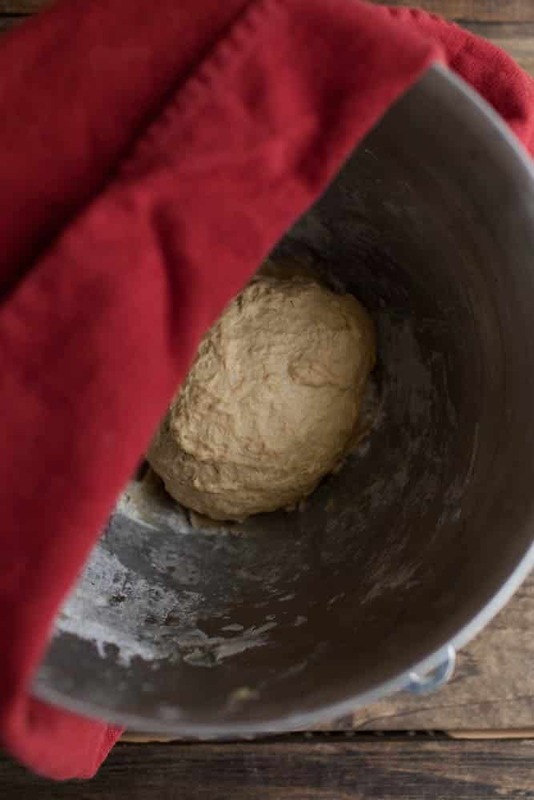 In a food processor, pulse oats until resembling a coarse flour. Add in the nuts/seeds and continue to pulse until the mixture resembles a nut meal-like texture. Next, measure in the tamari, miso, chili paste, spices, cooked and drained brown rice, red onion, parsley, and egg. Continue to pulse until the mixture is well combined. Wet your hands and divide mixture into 6 pieces. Pat the pieces into patties, approximately 1/2″ thick. Heat a skillet or grill pan over low heat. Cook patties on each side for 6-8 minutes (see note). Burgers should be crisp on the outside and warm in the center. Serve with your favorite toppings. *These burgers freeze well. Simply separate leftover burgers with wax paper and seal in a freezer-safe container. Let thaw slightly before cooking. Also, because of the make-up, these burgers are better cooked on the stove top than tried on the grill. * Upon recent testing, the burgers are amazing fried. Use a pan with about 1/4″ of sunflower oil. Heat over medium-low heat until water sizzles. Add the burgers and fry for about 4 minutes, until brown. Flip and cook for another 4 minutes. 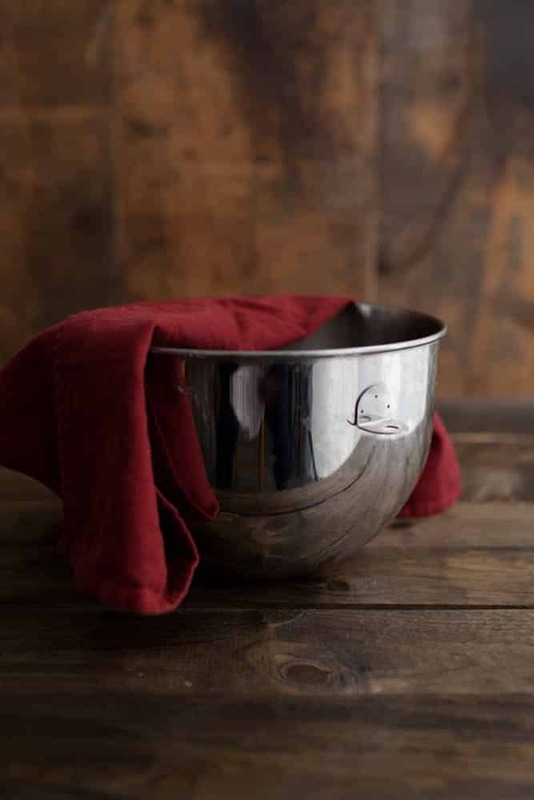 Place on a paper towel to absorb the oil and serve. * While not quite as moist, these burgers do work without the egg. Try pulsing the mixture a bit more to make it cohesive without the egg. I make homemade burgers all the time, but have never even thought to put rice in them – good call!! I need to try this soon! These look wonderful! I agree it isn’t necessary for the veggie burger to stay perfectly together. My kids don’t love beans,so I know they will appreciate this alternative, Thanks! These look delicious. I am one of the rare people who loves to eat my veggie burgers with a fork and knife so I don’t care if they fall apart. This sounds fantastic! I’m so happy you guys got the break you deserved and that it was so lovely! Your pictures of the surrounding area are gorgeous! So peaceful. Your weekend away looks lovely – what a beautiful spot! 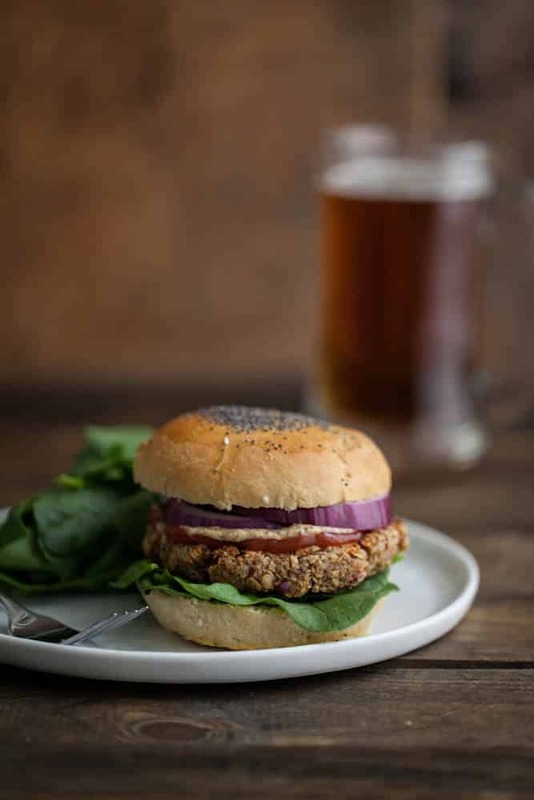 🙂 Im always on the hunt for new veggie burger recipes, will have to give this one a go! I used almonds and Bob’s 5 grain hot breakfast cereal, because that’s what I had and baked them at 400 for 15 minutes on each side. They were fantastic! Plus I have lunch in the freezer for several days! 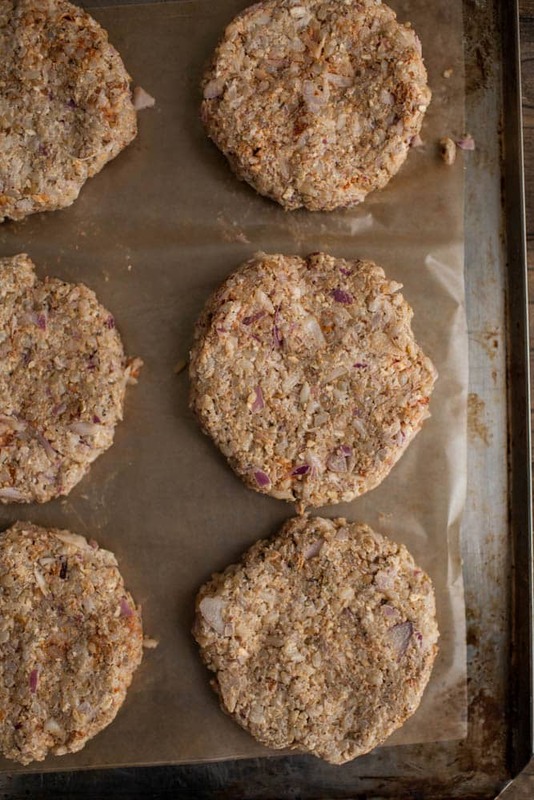 Erin, these are awesome – my new go-to veggie burger for sure! They stuck together with no problem after about 15 mins in the fridge. The flavor is just right – I also added some cumin and coriander. I made the WW(what what)/honey buns too – also fantastic! We should go to Sunflower Drive In in Fair Oaks and do a taste comparison… I think yours may be better! In an attempt to make Sunday Night Football healthier, we made these burgers, but served them as challah bread sliders with american cheese, sauteed onions, and mayo. They were SOOOOO good, especially paired with the breaded cauliflower. We were supposed to have the jalapeno poppers from your site too, but the dog knocked it to the ground just before it was going in to the oven for the second time 🙁 We will try the poppers again next week. 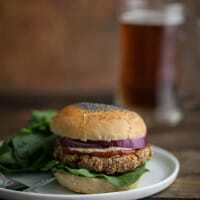 It looks like you have red onion in the burgers, but they arent listed in your ingredients? Good eye- recipe updated to include the onion! Do you have any suggestions for how the egg in the recipe could be replaced? 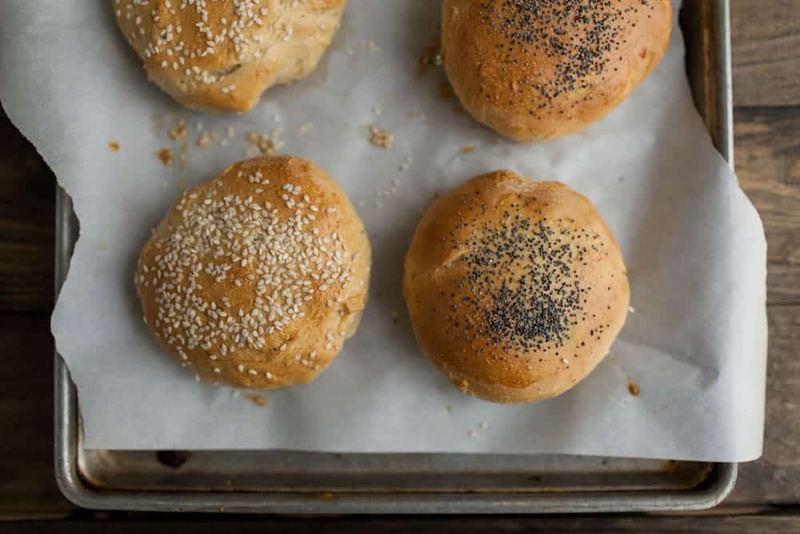 I made these *exactly* as written–minus the egg, as we’re rounding the corner to vegan. They were really good, held together beautifully, great texture, super caloric and, well, meaty. My teenage sons loved them. So did I! !